Create two lovely openings to your backyard or garden with these Gardman Black Rose Garden Arches. Adding an arbor around your path or to your front yard brings a bold look to it, and these two classic, steel units offer plenty of versatility. The round, tubular steel frame of each item assembles easily, and horizontal rods with plastic joiners provide plenty of support. A gentle arch furthers the classic look of each item, enhanced even more by their black, powder coated finish. The open sides of each arbor make them great for supporting a single vine or climbing plant, and this set of two units allows you to adorn two sections of your backyard. Create an entry and exit for your fenced garden for a different look, or place one arbor in front of the other for a deeper and more dramatic passageway to your home. The legs of each unit insert into soil for quick installation, or may be placed in a large planter for a portable setup. Bring classic style to your outdoor setting with these Black Rose Garden Arches. Assembly required. 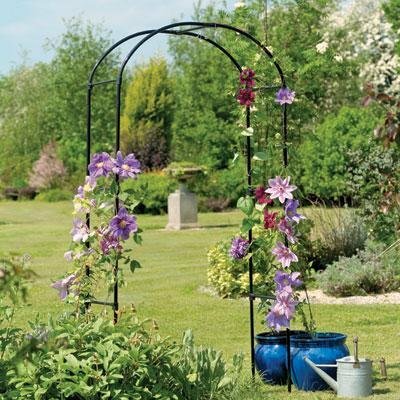 This case pack includes 2 of the Gardman Rose Garden Arches, Black, 90"H.